Blog Cokes, Ice and Your Teeth How Do They Mix? Cokes, Ice and Your Teeth How Do They Mix? Did you know “Mountain Dew Mouth” is a real thing? Well, it is, and it’s what happens to your teeth if you drink too many cokes. The name originates from rural Appalachia, where the carbonated beverage of choice has long been Moutain Dew, and not surprisingly tooth decay is alarmingly common. But this doesn’t just happen in Appalachia, and Mountain Dew isn’t the only drink that contributes to tooth decay. It seems on the outskirts of Chattanooga in Dunlap and Dayton, for example, Mountain Dew is replaced with Sun Drop, as the beverage of choice. It is all too often we see someone come in with rampant dental decay and they are holding a Sun Drop so they can sip it while sitting in the dental chair. It makes it easy for us to identify the cause of all the decay. A soda addiction can be a very hard habit to kick. In this blog post, we will use the word “cokes” not meaning only Coca-Cola, but as we do here in the south, a reference to soft drinks in general. While we are at it let’s throw in sweet tea as well. While the tea lacks the carbonation, we make up for it with the high amount of sugar in it. We all know someone who orders sweet tea at a restaurant then puts more sugar in it once it is at the table. Admit it you might be the person that has done this a time or two. When we eat or drink something with sugar in it, the sugar sticks to our teeth after. Sugar on its own doesn’t do any harm to our oral health, but it is, unfortunately, the ideal food of the bacteria that live in our mouths. These bacteria consume the sugar and then excrete acids that erode our teeth’s precious enamel, which of course leads to serious tooth decay. In addition to decay bacteria also causes inflammation that increases the risk of gum disease. In fact, any source of sugar can negatively affect your oral health. Sugary beverages including fruit juice, but particularly cokes) are especially dangerous because they don’t fill you up like solid food does and are pretty easy to keep drinking all day. So if sugar is the issue, then can’t we keep our teeth healthy by changing to diet soda rather than giving up carbonated drinks altogether? Diet soda is unquestionably an improvement, but sugar isn’t soda’s only threat to dental health. The other is acid. Sugar leads to tooth decay because oral bacteria consume sugar and excrete acid that erodes tooth enamel. Soda cuts out the middleman and applies acid directly to your teeth. Even carbonated water and diet sodas contain acid. The three types of acid commonly found in carbonated beverages are phosphoric, citric and carbonic. Many colas get their flavor from phosphoric acid, and any drink with citrus flavoring will have citric acid, and carbonic acid is what makes these drinks fizzy in the first place. Of course, it would be better for your teeth to avoid cokes and other sugar-filled drinks entirely. If you can’t quit your favorite drink completely though, there are a few ways to have it while protecting your teeth. Instead of sipping cokes from a bottle or can throughout the day only drink cokes with a meal so that the sugar and acid aren’t remaining in your mouth for extended periods of time. Rinse away lingering sugar by drinking water after the soda which can also help balance your mouth’s pH. Finally, brushing your teeth can clean away the last traces of sugar and acid left from soda, but it’s a good idea to wait about 30 minutes for the pH balance in your mouth to return to normal before brushing. It is particularly important for people with braces and children to avoid excess sugary beverages. Braces and a soda habit is a great way to end up with stained teeth when the braces come off, and children have the highest risk of enamel erosion because their enamel isn’t yet fully developed. If none of these things can work for you chewing a piece of sugar-free gum with xylitol will help immensely. If you are going to drink cokes of any brand do the diet ones. At least the sugar isn’t built in for the bacteria to start eating immediately. Crunching on ice seems to come naturally to some people. The image on the cover of this post is from a gas station on Signal Mountain BLVD. 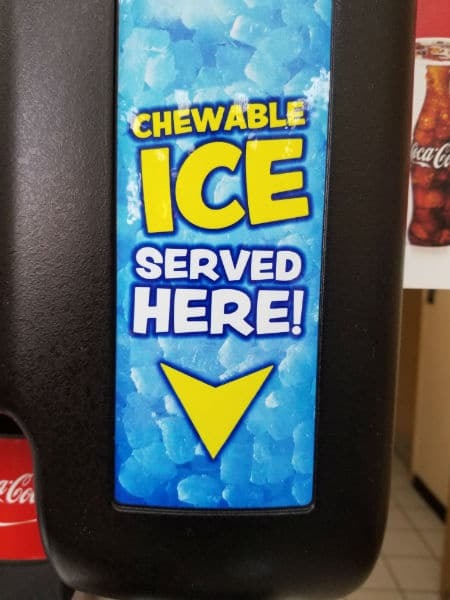 We wonder about the liability of telling people it is chewable ice. No ice is chewable it all can break your teeth. So if you tell someone to chew it and they break a tooth do you have to pay for their dental bill? We don’t pretend to be lawyers or anything, but we know this is terrible advice. Do not chew the ice in your drink. You will get away with it a few times, but one day when the tooth breaks you will wish you could go back to seconds earlier when you were chewing that ice and not do it. Don’t Forget We Are Here To Help! Following these good habits will go a long way towards defending your teeth against decay and erosion from the sugar and acid in cokes. Still, remember Dr. McOmie and our staff is also an important part of the equation. We can tell you ways to help re-mineralize your teeth if you do drink lots of cokes. We can educate you on how to drink sugary beverages with an acidic pH and keep the damage to a minimum. Things like fluoride varnish at your cleaning appointments, take home prescription fluoride, saliva stimulants can help keep your mouth healthy. Keep scheduling those visits every six months! We hope you enjoy our blog posts, thank you for reading this one. As always we want to be your dentist and we want you to send your friends to us as well. Give us a call 423-902-4763.